- George Bush and Ben Bernanke gave a helping hand to the market last week with their accomodative talk. Lucky perhaps, but also part of the expected market script. - Gold is back in positive mode once again, as the light bulb goes on for investors and traders as to what is most likely ahead. 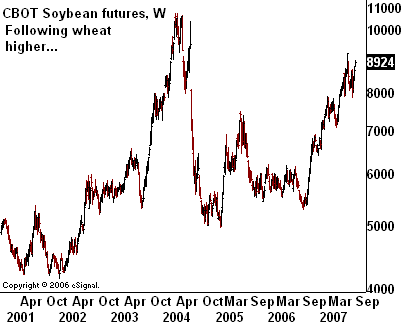 - As soybean futures follow wheat futures higher, it seems clear Wall Street is still oblivious to the perfect storm brewing for grains. 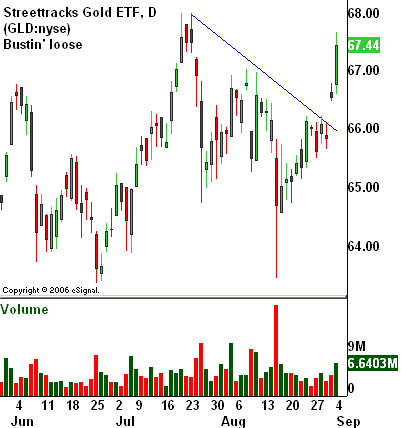 IN THE MIDDLE OF LAST WEEK or so, the Consilient trading portfolio added three new long trades -- the Energy Select SPDR (XLE:amex), the Pro Shares Ultra QQQ ETF (QLD:amex), and the Streettracks gold ETF (GLD:nyse). Things were looking hairy at first, but soon turned around quite nicely... thanks to a little help from our friends, George Bush and Ben Bernanke. The President and the Fed Chief sang an accommodative tune, hinting loudly at rate cut possibilities and distressed homeowner largesse. The rapid turnaround might be classified as a bit of luck (which every wise trader welcomes). And yet, an indulgent helping hand has always been a part of our market script. When Macro Musings pounded the table for gold stocks a few weeks ago, a key piece of the argument was the return of stimulative, i.e. inflationary, monetary policy with a clear "rescue" bias. As with all our trades, these three had reasons technical and fundamental behind them; it's just harder to be chronologically precise on the fundamental side. Kudos to George and Ben for their timing. GOLD IS BACK in positive mode once again, as the light bulb goes on for investors and traders as to what is most likely ahead. A combination of stimulative monetary policy and accommodative (read: not horrible) corporate profits is a recipe for ongoing inflation creep and a continued trend of paper asset inflation. Except now, with a good bit of hot air sucked out of the financials, there is more room for safe haven niches and inflationary plays, as efforts to bail out Joe Homeowner wind up helping Joe Goldowner by accident. The remarkable thing about energy stocks' run, in tandem with the rise of crude oil, was the way $70 a barrel oil seemed to put no meaningful damper on demand. We are still seeing that combo work its magic as crude makes its way into the mid $70s once again. Energy stocks can arguably be seen as an inflation hedge, a global growth play, and a peak oil play all at once. TECH STOCKS ARE THE NEW BLACK in a sea of subprime red. While the rest of the country frets over mortgage meltdowns and credit downgrades, the Silicon Valley boys and girls are dreaming of all the profits to be made from "Web 2.0." Private companies like Facebook dream of going public and becoming the next Google; gadgets like the iPhone have the world clamoring for endless consumer bandwidth; and hardware companies like Cisco are hitting 52-week highs on the prospect of selling all the internet plumbing required to make "web 2.0" possible. EMERGING MARKETS have taken a nasty beating and bounced back smartly since. 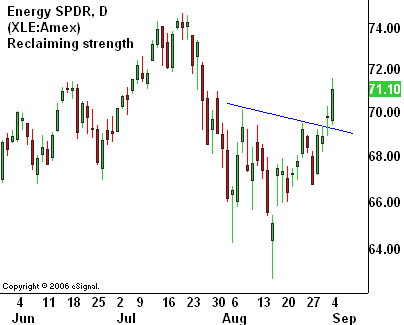 As noted in a previous Tactical View , the chart patterns have looked similar across the board. While looking much better on the whole, few emerging market ETFs have surpassed their previous highs. 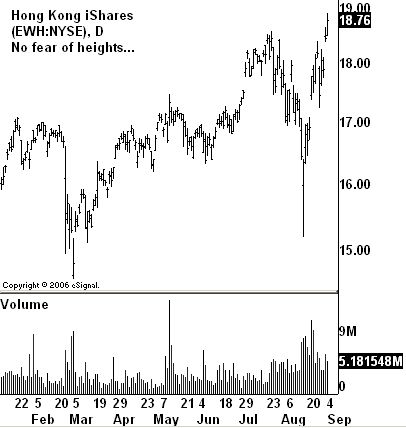 One exception is EWH, the Hong Kong iShares ETF, which has gone on to new heights even as most others have lagged. Top holdings of EWH include Asian stalwarts like Hutchison Whampoa, Cheung Kong holdings, and Sun Hung Kai Properties. COUNTRYWIDE FINANCIAL still has potential to be a "damsel in distress"... a tongue-in-cheek term we deployed in an essay on the great investment fortunes, Fortune Building 101 . Unfortunately for current Countrywide shareholders, one white knight has already been rebuffed. Bank of America heroically threw $2 billion at the bleeding mortgage lender, expecting its vote of confidence to be rewarded with a sustainably higher share price. 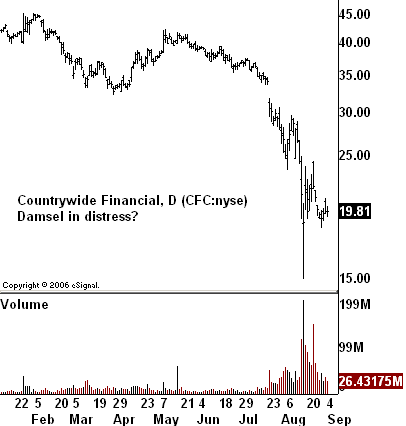 No such luck...Wall Street is still worried about the darker corners of Countrywide's books, not to mention its ability to weather further damage if the credit storm intensifies. But if things get much uglier for CFC, the original damsel-rescuer may yet step in. Given CFC's size and general reputation (tarnished subprime activities aside), the company's woes bear at least passing resemblance to the "salad oil scandal" that hit American Express in the 1960s, after which Warren Buffett purchased a gigantic block of Amex stock at severely depressed prices. Mr. Buffett, who currently sits on $50 billion in cash, has said he can "spend money faster than Imelda Marcos" when the opportunity is right. Presumably he isn't talking a closet full of shoes... and isn't the only distressed buyer watching the markets with a keen eye. THE JAPANESE YEN has been unleashed. 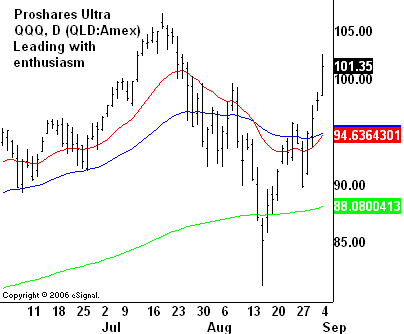 After a long stretch of sleepy movement, volatility is now the order of the day. 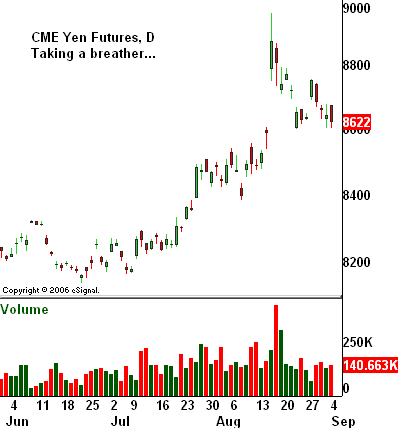 The Yen exploded as credit markets imploded; as credit fears take a breather, so does the carry trade bottle-rocket. Large and small speculators are now net long CME Yen futures, the latest Commitment of Traders report indicates. But the $64 trillion yen question is, whither the Japanese public? "Mrs. Watanabe," the Japanese reincarnation of the American day trader circa 1999, is still presumably betting hard against her own currency. When the Japanese public start calling in their global forex bets, we could see the yen go into its next stage of orbit. 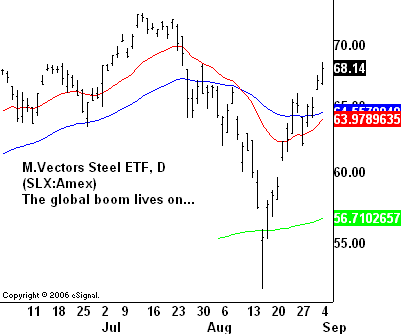 THE MARKET VECTORS STEEL ETF continues to show, uh, steely strength (groan), thanks to solid international holdings like Posco (PKX:nyse), Companhia Vale do Rio Doce (RIO:nyse), and Mittal Steel (MT:nyse). Steel is a good reminder that the global boom will not necessarily be knuckled under by subprime woes. There are still a lot of dollars sloshing around -- trillions of them in Sovereign Wealth Funds and global central bank coffers -- and a lot of building to do. Steelmakers are benefiting from a long-term trend of consolidation (scooping up previously fragmented producers) and dampened volatility as global growth prospects, and construction projects, take hold on a broader scale. "Beans in the teens!" is the old, if seldom heard, rallying cry. Perhaps we'll be hearing it again soon if wheat keeps leading the way. Justice Litle is the editor and founder of Consilient Investor. Consilient Investor is a broad ranging collection of articles ( written by yours truly) on markets, trading and investing... and big ideas related to such. It is also home to the Consilient Circle, a unique trading and investing service.